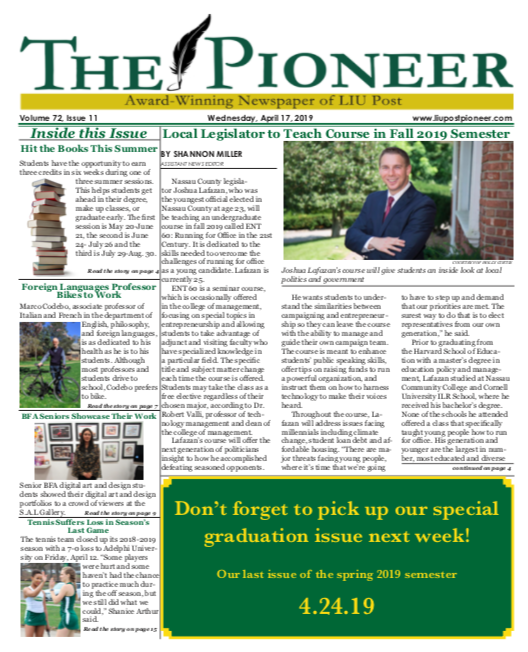 With the baseball season in full swing, the Pioneers came back to Brookville to play their first home game on Saturday, March 17 after opening the season with 14 games away. The first 14 games of the season were monumental for some players. Junior pitcher James Varela, was awarded East Coast Conference Player of The Week on March 12 after pitching all nine innings and striking out 12 batters against Franklin Pierce University on March 10 in Cary, North Carolina (N.C.) for the Pioneers. 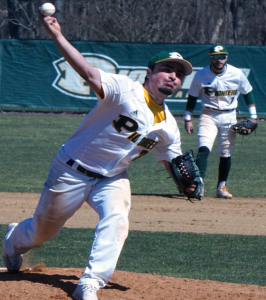 Junior infielder Jimmy Mendyk also had a game to remember on the road when he picked up four hits to aid in a win for the Pioneers against Dominican College on March 11. Coach Michael Gaffney is pleased that the team has returned home after spending many weekends on the road. “We feel better about playing on our field, sleeping in our beds and leaving our suitcases unpacked, but the snow is our only wrinkle.” Even though the team travels to N.C. and S.C. to begin every season. The Pioneers are the only Division II baseball team that still has a grass baseball field, which is now outdated. Fortunately, the Pioneers have the ability to use the fields at both Adelphi University and the New York Institute of Technology (NYIT) in cases of inclement weather since turf fields are able to sustain their structure during bad weather unlike a traditional grass baseball field. Turf is safer for playing any sport since it doesn’t create puddles of water, which can lead to injuries. The Pioneers will play their next game at home against the NYIT Bears on Friday, March 23.